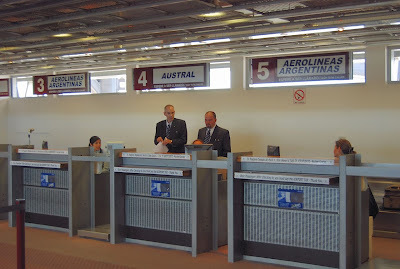 The Southern Cone’s two major airlines, Aerolíneas Argentinas and Chile’s LAN Airlines, both originated as state-run carriers at a time when virtually every South American country ran its own flagship. In the early days of South American air travel, of course, only the state had the resources to purchase planes and operate flights - often with military pilots - to a network of destinations around each country and overseas. The history’s a little more complicated than that, but for many decades both airlines operated at greater or lesser, mostly lesser, levels of efficiency, and they often bled money. Once, when I flew on Aerolíneas from Buenos Aires to Miami in early 1981, I recall no more than about 20 passengers on the entire plane and, though I wasn’t in first class, I was able to stretch out across three seats for a good night’s sleep. Admittedly, this is anecdotal evidence from a single experience, but it's not hard to imagine the scale of losses on one of the continent's most popular international routes. LAN underwent privatization in late 1989, while Aerolíneas did so a year later, but since then their histories could not be more different. Under its Chilean ownership – which once included current Chilean president Sebastián Piñera - LAN has modernized its fleet, professionalized its services, and expanded its routes (with subsidiaries in Ecuador, Peru, Colombia and Argentina). 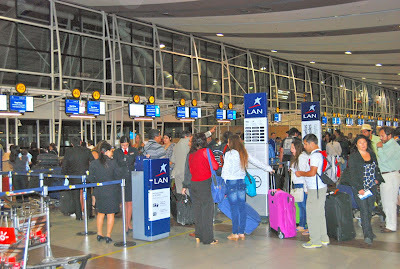 Most recently, it has merged with Brazil’s TAM to form the LATAM Airlines Group, the tenth-largest system in the world. 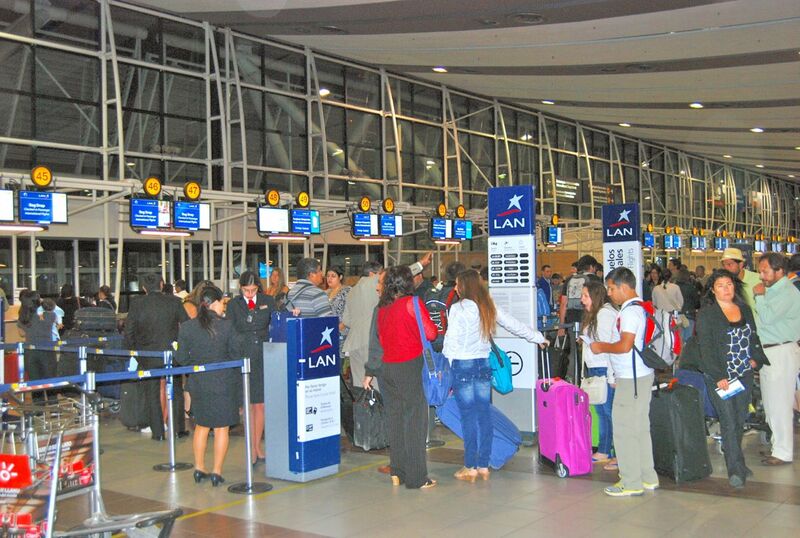 While retaining their brand names, LAN and TAM together will cover some 150 destinations in 22 countries. They are also partners of the OneWorld Alliance, with codeshares and frequent flyer programs around the globe. Aerolíneas has moved in the opposite direction. 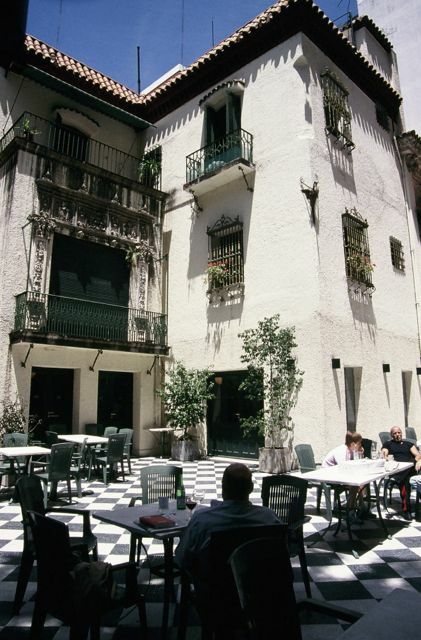 Its privatization failed for a variety of reasons – some of them political rather than economic – and its operations became notorious for delays and cancellations under a series of Argentine and Spanish owners; at one point, its only foreign destination was Madrid. The company even suffered a bankruptcy in 2003 and, in 2008, the government of the late President Néstor Kirchner expropriated and renationalized it. I'd like to be able to say that state management has improved matters but, to all appearances, things have gotten worse. Now managed by political appointees allied with the Peronist youth wing La Cámpora, Aerolíneas remains an operational and financial catastrophe. In a recent TV program, investigative journalist Jorge Lanata detailed further deterioration under the new regime, which has expanded its personnel even as it has reduced its schedules and continues to hemorrhage losses. I can’t repeat all Lanata’s findings here, but a couple examples really stand out. The company is presently paying US$565,000 monthly rent for a Jumbo jet, parked at the international airport at Ezeiza, that it cannot return until the lease expires in February of 2014. Its only recent use has been a high-profile trade mission that current president Cristina Fernández led to Angola – a country whose ability to acquire Argentine exports is limited – last month. Perhaps the most damning stat, though, is the fact that the company fills every one of the 280 seats on its daily Buenos Aires to Madrid route, but that it would have to sell another 40 just to break even. On top of that, only recently has it managed to negotiate codeshare agreements with AirFrance-KLM in Europe and Delta in the United States; for many years, the company had no frequent flyer program, and only recently has it joined the AirFrance-KLM Flying Blue program. Whenever I'm on the road, after a 12 to 14-hour day updating my Moon Handbooks to the Southern Cone countries, I need to read to get to sleep. After a late dinner - rarely ending before 11 p.m. in either Argentina or Chile - I normally prefer something escapist like a detective novel, and usually in English. I rarely read literature, even genre literature, in Spanish; although my Spanish is fluent, I learned by doing it - I've taken less than a year's instruction, and it's neither a native nor a literary Spanish. Rather, it's a combination of traveler's and academic Spanish that I learned on the road and in graduate school. I read Spanish-language newspapers, as well as history, anthropology, geography and the like. I've acquired my vocabulary in several countries, and often use idioms whose origins I cannot recall - some are mexicanismos, other chilenismos, other argentinismos. When I first met my wife’s brother, I once told him I was going out but would return al tiro which, in Chilean Spanish, means "right away" (literally, "like a shot"). To an Argentine, the same words would suggest I was going to the shooting range. 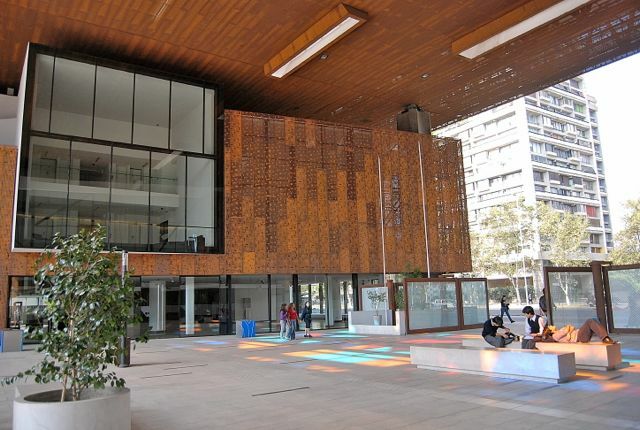 Over the years, my accent has morphed from fairly generic Mexican to that of an Aymara llama herder to standard Chilean to what my wife calls "Porteño de Avellaneda," after a working class suburb of Buenos Aires. That can change, though, depending where I find myself. Given my hybrid language skills, I've mostly refrained from fiction but, several years ago, I read Roberto Ampuero's mystery El Alemán de Atacama ("The German of Atacama") on the recommendation of a friend from Pucón. Its setting in and around the tourist Mecca of San Pedro de Atacama gave it obvious appeal, and Ampuero's straightforward dialogue made it an ideal choice for a reader for whom literary Spanish was a challenge. 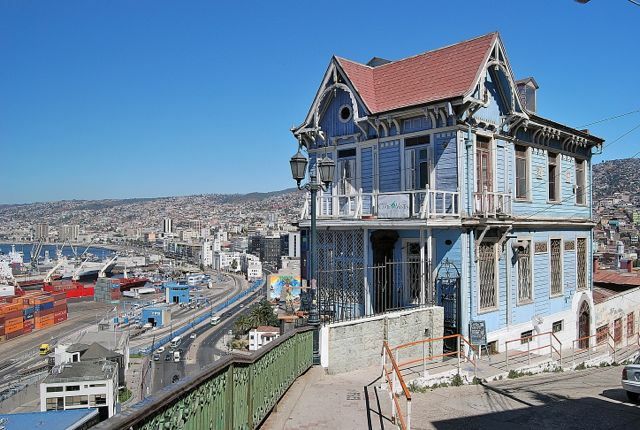 His Valparaíso-based Cuban detective, Cayetano Brulé, is a private eye who bears a superficial resemblance to Raymond Chandler's Philip Marlowe, if less self-consciously noir-ish. 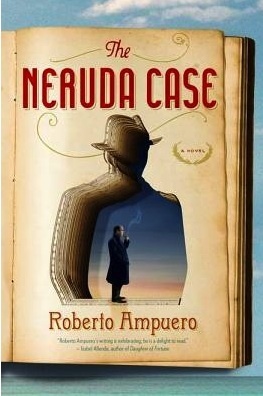 Until now, none of Ampuero's novels has appeared in English but his latest The Neruda Case has just appeared on the US market. It begins in the early 1970s, when Brulé - then a novice who reads Georges Simenon's Maigret novels as a primer - agrees to track down a missing woman for ailing poet Pablo Neruda, whom he has met fortuitously at a party. The trail takes Brulé on a continent-hopping journey from Chile to Mexico, Cuba and East Germany before ending up back in Chile during the turmoil of the 1973 coup against President Salvador Allende. Unlike El Alemán de Atacama, The Neruda Case is not a genre novel in the strict sense. In an afterword, Ampuero - who teaches creative writing at the University of Iowa - admits it's also a regretful homage to Neruda whom the young novelist, growing up near the poet's Valparaíso house in the 1960s, was too timid to approach. Anyone traveling to Chile, or interested in Neruda's life, will find much to enjoy here - even as you fight off a well-deserved night's sleep after a full day of sightseeing and a seafood dinner in Valpo. A word on the translation, or rather the translator: Carolina de Robertis, a fellow Oaklander of Uruguayan origin, is also the author of Perla, a ghostly novel of Argentina in the aftermath of the Dirty War. She provided me an early uncorrected proof of The Neruda Case as well as a copy of her own novel, which I plan to review soon. Researchers who visit Rapa Nui (Easter Island) are, understandably, focused on archaeology. Its part in the peopling of the Pacific, and the tale behind its massive moai, are topics that stimulate academics and excite the popular imagination. They can still elicit controversy, as with a new theory of how the megaliths moved from their “nursery” at Rano Raraku to broad ahu (platforms) around the island. It’s disappointing, though, that Rapanuiphiles and local authorities are focused on this to the exclusion of contemporary history (which I shall define as history within the life span of somebody alive today). 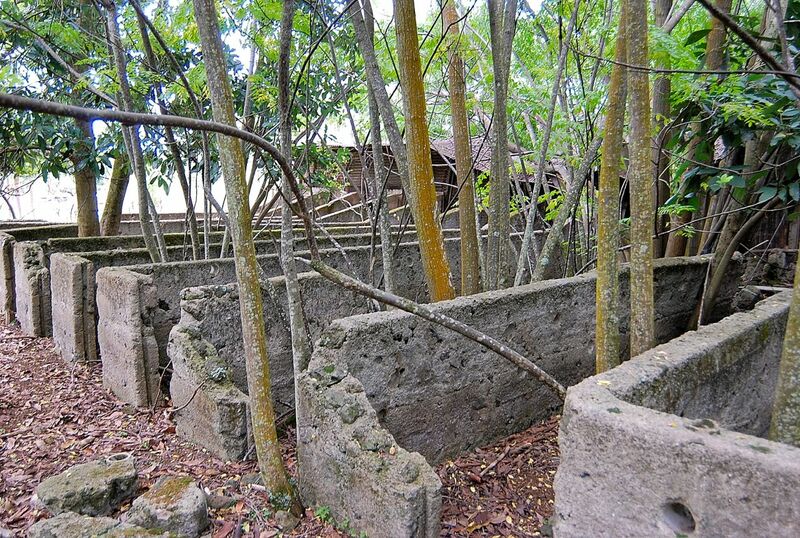 When I visited the island in April, I was disappointed to see the dilapidated state of Fundo Vaitea (pictured above), the one-time sheep ranch founded by the abusive Frenchman Jean-Baptiste Dutroux-Bornier in 1870. Dutroux-Bornier died at the hands of the Rapanui themselves, but the sheep ranch survived under the management of the Valparaíso-based Williamson, Balfour & Company, which essentially governed the island from 1888 to 1952 as the Compañía Explotadora de la Isla de Pascua (CEDIP). After 1952, Chile had a greater administrative presence in its remote Pacific possession, first through the navy and then through civilian government. 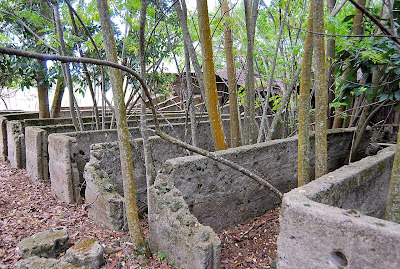 I first saw Vaitea on my initial visit to the island, about 20 years ago, when the wool shed (above) and concrete sheep dips (below) were in relatively good condition (I have never seen a sheep on the island, though there are cattle and, of course, the overpopulation of horses has caused serious environmental damage). On my recent trip, though, the shed was on the point of collapse, the machinery within was rusting, and volunteer trees were growing within the dip. Eventually, unless action is taken, the trees will pull those installations apart. Obviously, the deteriorating remains of a sheep ranch are less significant than ancient archaeological sites that can help explain some of the biggest questions in Polynesian prehistory. 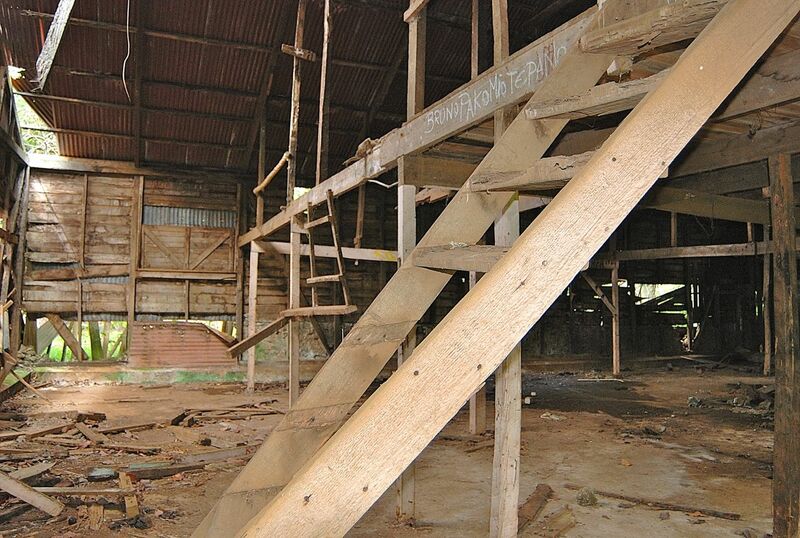 On the other hand, unless some historical archaeologist takes an interest soon – such a project was recently announced – Vaitea could suffer a regrettable and utterly preventable loss of valuable artifacts to reconstruct a period that’s been largely neglected. 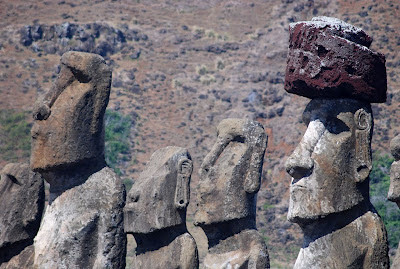 Meanwhile, with that in mind, the Eighth International Conference on Easter Island and the Pacific will take place from July 8 to 13 at the Hyatt Vineyard Creek Hotel & Spa in Santa Rosa, California, about an hour north of my home in Oakland, and I hope to attend. Its theme is “Living in Changing Island Environments,” and anybody is welcome – presuming, of course, you wish to splurge on the $295 registration fee that includes the welcome banquet with Australian anthropologist Grant McCall. 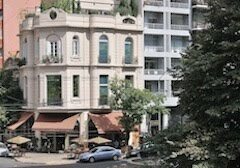 Today’s entry focuses partially on my own current and recent activities, and a potentially encouraging development in Argentina. Every month, Air Canada’s inflight magazine En Route features a “High & Low” department that focuses on a destination from distinct price viewpoints as reflected in the section’s title. This month, I myself wrote “Santiago Two Ways” to cover alternative options for wine (Baco Vino y Bistro, as pictured at top, and Viña Santa Carolina, pictured above), culture (the Teatro Municipal and the Centro Gabriela Mistral, pictured below), and dinner (Zully and Galindo) in the Chilean capital. The succinct coverage was a challenge and, even then, I only had to write half of it – as it must do, En Route also translated my original text into French for its Quebecois clients. This weekend, I can breathe a sigh of relief as I submit the manuscript for the upcoming fourth edition of Moon Handbooks Chile. That’s a little later than I anticipated because a delayed departure for South America, followed by successive bronchitis attacks in Buenos Aires and Santiago, slowed my research. 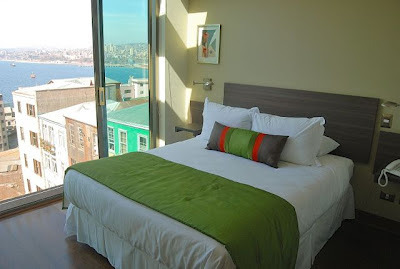 Still I was able to spend two and a half productive months in the Southern Cone. Now the editorial process gets underway and, with a little luck, the new edition will be on the shelves before year’s end. Look for substantial improvement in the coverage of hotels and restaurants, especially in key destinations like Santiago, Valparaíso (note the Hotel 17, above, and the view restaurant Casa Cuatro Vientos, below), the Colchagua valley wine district, San Pedro de Atacama, Puerto Varas, Puerto Natales, and Rapa Nui (Easter Island). Yesterday, Argentine interior minister Florenco Randazzo publicly presented the new Argentine passport, a state-of-the-art document that carries the bearer’s personal data on a microchip. At first glance, this wouldn’t seem to matter much to non-Argentines or even many Argentines who live overseas – my Argentine-born wife, for example finds it simpler to travel there on her US passport. Still, this has potential significance for many foreigners interested in traveling to Buenos Aires and beyond. That’s because, according to Randazzo, the government plans to petition foreign governments that require visas from Argentine travelers to lift those visa requirements because the new documents are more difficult to falsify than the older ones. 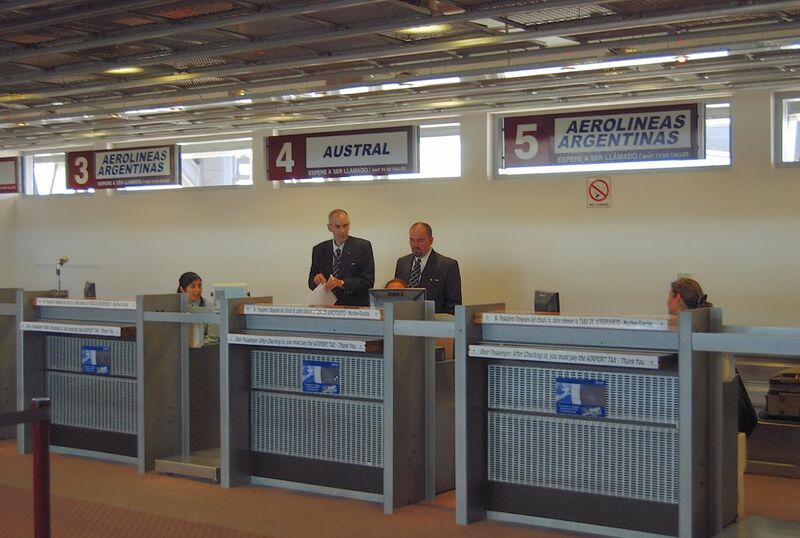 If the governments in question – primarily the US, Canada, and Australia - accept the proposal, though, it could mean the end of Argentina’s own expensive and irritating “reciprocity fee” imposed on travelers from those countries. The end of that ill-considered and counter-productive measure (which was really a “retaliation fee” against the governments mentioned above, with the US the primary target) would be a positive development for everybody. Still, it’s easier to impose such measures than it is to revoke them. 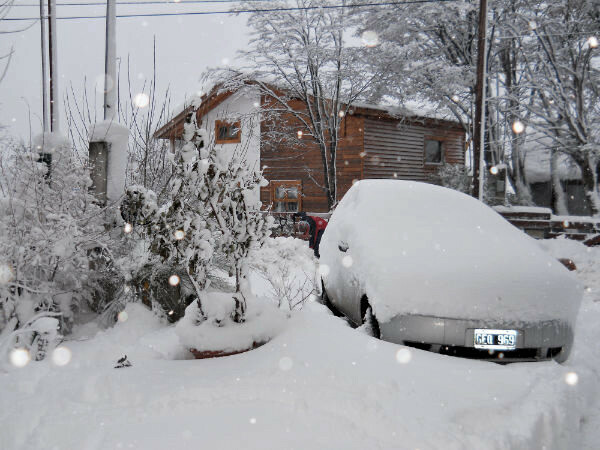 The world’s southernmost city, Ushuaia is under a white blanket after a series of snowstorms that closed the only road out of town (except for vehicles with chains) and will continue for several days. 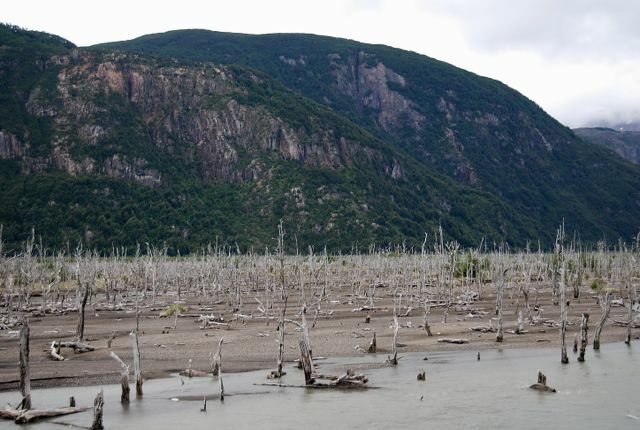 While snow isn’t unusual in the mountainous southern half of Tierra del Fuego – even in midsummer it never disappears from the surrounding peaks – it’s a little uncommon to have this sort of accumulation at sea level. It has paralyzed a city with steep streets and sidewalks and, while the airport is not closed, schools, banks and municipal offices are. 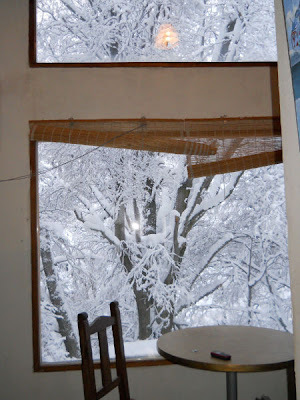 On the bright side, it makes for a promising ski season at Cerro Castor and other nearby sites. Elsa, who took the photographs here from her house, adds that she hasn’t gone outdoors in two days. That won’t be an issue when they arrive in Los Angeles the first week of August, to spend some beach time in San Diego and some city time at our house in Oakland. 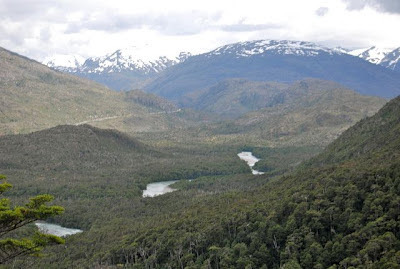 Sounds unseasonal, doesn’t it, with snow covering the streets and southern beech forests of Tierra del Fuego? Some weeks ago, though, CEO Franco Bertone of Telecom Argentina remarked that the easiest way for an Argentine to obtain an iPhone is to travel to Miami, and he wasn’t exaggerating. That’s because, in March, domestic trade secretary Guillermo Moreno banned the importation of smartphones not manufactured in Argentina; by default, the Blackberry has become the smartphone of choice because it’s produced in Ushuaia, of all places. Or is it? A few days ago, on his TV program Periodismo para Todos (“Journalism for Everyone”), the sardonic but respected journalist Jorge Lanata reported that, despite labels that read Hecho en Argentina (“made in Argentina”), Blackberrys are merely assembled there: everything comes from China except for the polystyrene packing and the stamp that says it’s made in-country. The punning Lanata calls this a cuento chino (literally a “Chinese tale,” but roughly translatable as a “big lie”). He adds that since Moreno imposed import controls, 4,000 Fuegians have lost their jobs (Tierra del Fuego is ostensibly a duty-free zone). It sounds as if the government’s boast of Argentine-made smartphones may be just another snow job. Gardel Barks Better Every Day! Nostalgic Argentines always claim that Carlos Gardel, who died in a Colombian plane crash in 1935, sings better every day. That’s a way of proclaiming their devotion to, and the timelessness of, the legendary tango singer’s body of work. But if there’s one thing that Argentines, and especially Porteños, adore as much or more than the man who sang Mi Buenos Aires Querido (“My Dear Buenos Aires”), it’s their dogs. 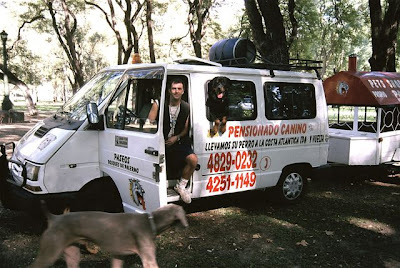 Several years ago, I wrote an article about a dog-oriented entrepreneur in Buenos Aires who, in the aftermath of the 2002 economic meltdown, was making a pretty good living exercising apartment-bound animals for their owners. Paseaperros (dogwalkers) leading eight or more canines on leashes have long been a common sight in the city, but he and his partner earned the bulk of their income shuttling canines to the beach resort of Mar del Plata and back during summer vacation time. Many if not most Porteños do not have room for both the family and the animal in their private cars (or for that matter, may not even have cars). Thus, a mobile kennel was an elegant solution to the problem of keeping the extended family together. 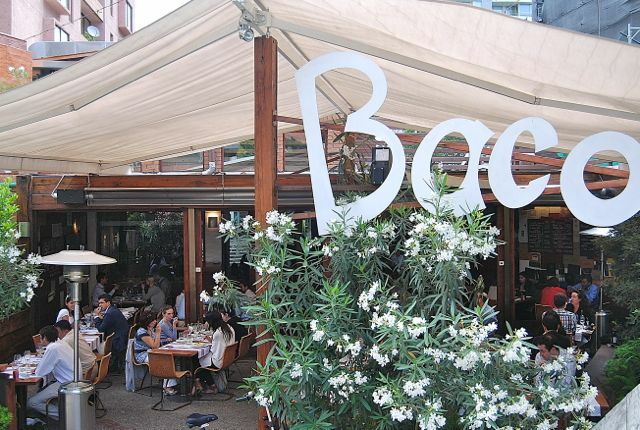 Since then, if anything, Argentines have become even more dog-centric, with numerous dog parks, plus “pet-friendly” restaurants like the Museo Evita (above), around the corner from our own Palermo apartment, that welcome four-footed mascots (at least in their patio). 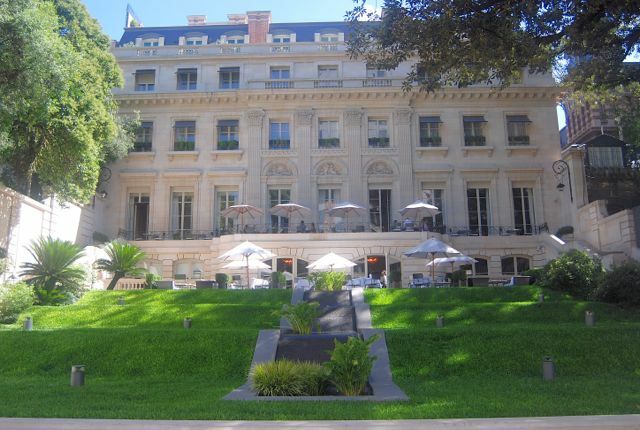 Luxury accommodations, including the Faena Hotel & Universe, Four Season Buenos Aires, and Palacio Duhau Park Hyatt (pictured below) all offer packages that include doggie treats and toys (the Duhau’s goes by the name “Very Important Pet”). 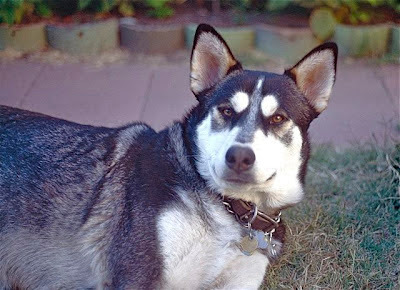 There's a plethora of pet boutiques and information sources, including a print and online magazine that goes by the title Oh My Dog. To their credit, the magazine promotes canine rescue services along with its fashion celebrity coverage and their purebreds. Canine droppings, unfortunately, continue to dapple the city’s sidewalks. Whenever I’m in town, I always carry a few small plastic bags in my daypack so that, when I pass someone whose Doberman is depositing soretes on the sidewalk, I can point out to the owner that “Se te cayó algo…” (Loosely translated, “you dropped something…”) and provide him or her an alternative to leaving it there. Usually they are taken aback, but they get the message and sometimes even thank me for it. It seems a slow process sometimes, but they’re learning. The Buenos Aires daily Clarín is the world’s largest circulation Spanish-language newspaper and, a few days ago, I was simultaneously surprised, flattered and disappointed to see myself quoted extensively on its website (and presumably in the print edition) the other day. That requires some explanation. In the mid-1990s, while working for another guidebook publisher best not mentioned by name, I wrote a sidebar about the so-called “Menem Trucho” (“Bogus Menem”), a pseudo-banknote glorifying then President Carlos Menem. It was the work of Armando Gostanián, a political hack who was then in charge of the Casa de la Moneda, Argentina’s national mint. 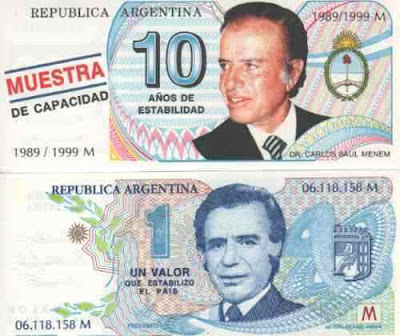 It also included the punning motto “1 Valor Que Estabilizó al País,” mimicking the numerical value of a real banknote while suggesting that Menem possessed “Bravery That Stabilized the Country” (which admittedly, had been chaotic when he won the office in 1989). Gostanián’s big problem was that he used official paper to create the pseudo-banknote – the equivalent of the US mint printing a fake dollar bill to promote the re-election of a sitting president. That got him in hot water, though nothing eventually came of it and, several years later, Menem’s abortive re-election campaign came up with a less official-looking substitute that extolled his “10 Years of Stability” and his “Muestra de Capacidad.” The latter was also a pun, praising his “Proof of Ability” but, at the same time, it openly admitted that it was a “sample,” not an official banknote. Clarín used my piece to establish a parallel with Argentina’s current vice-president Amado Boudou, presently under investigation for influence peddling over contracts awarded for the printing of 100-peso banknotes. The kicker is that the guitar-playing vice-president has become the subject of his own photoshopped “Boudou Trucho.” Text on the note says, among other things, “Banco Central de la Guitarrita Argentina” (Central Bank of the Little Argentine Guitar). It’s only fair to add that Clarín is an outspoken editorial critic of the administration of Cristina Fernández de Kirchner. Political motives aside, it’s flattering to see one’s work acknowledged in public. What’s disappointing is that Clarín attributes my writing to a redactor (“editor” in Spanish), but that’s because my former publisher, unfortunately, holds copyright to the work. That is the case with most guidebook publishers, though Moon is a welcome exception. Over the course of 30-years-plus living and traveling in Argentina, I’ve seen Argentine currency evolve (?) from the peso ley (1970-1983) to the peso argentino (1983-1985) to the austral (1985-1991) to the peso convertible (1992-present), with banknotes that sometimes are barely worth the paper they’re printed on. When my wife and I married in 1981, we changed cash gifts of 3.6 million pesos ley into dollars as quickly as we could. While the current peso is perhaps misnamed – given recent exchange controls, it’s hard to call it truly convertible – some new banknotes may soon appear in Argentine wallets and handbags. Next month, on the 60th anniversary of Evita Perón’s death, the government will issue a new five-peso note with her likeness (based on one that never reached circulation when, in the mid-1950s, a military coup overthrew Juan Domingo Perón). At the same time, the government is due to decide whether a new 500-peso note will bear the image of Perón or former President Hipólito Yrigoyen, though the photoshoppers have suggested that the late President Néstor Kirchner might be the most suitable choice for a bill that, effectively, acknowledges the inflation that’s taken place under his government and his widow’s. Announcing the Winners: Let's Choose (Moon) Patagonia! 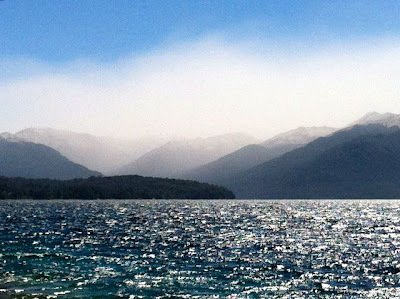 In the last few years, southern Chile’s volcanoes have spewed thousands of tons of ash into the skies of Patagonia, but the primary victim has been neighboring Argentina, as the prevailing westerlies drop most of the debris across the Andes (though the jet stream carries some of it, in a distance-decay effect, around the globe as far as Australia). 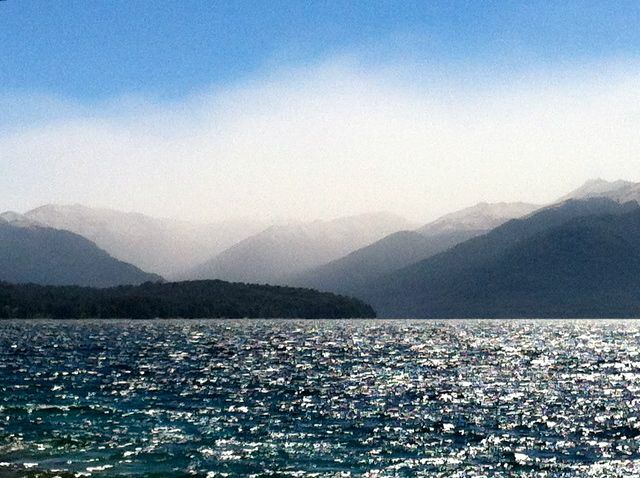 The most recent culprit has been the Puyehue-Cordón Caulle complex, which erupted about a year ago, ruining the last ski season and summer at the Argentine resorts of Villa la Angostura and Bariloche. The iPhone photograph below, which my wife took in March, shows a cloud of ash advancing from Chile. As my recent post reported, Bariloche is now advertising that, as the skies clear and the airport reopens, authorities are optimistic about the upcoming ski season. 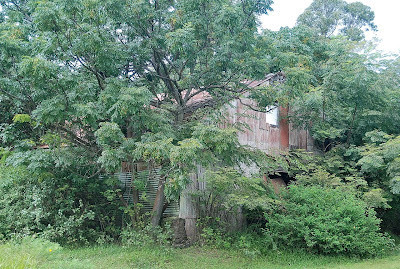 Of course, it’s only been a few years (2008) since the more southerly Volcán Chaitén forced the occupation of its namesake Chilean village but also dramatically impacted the Argentine side of the border. Local opposition to a government decision to relocate the village to the safer site of Santa Bárbara forced reluctant authorities to restore essential services, including electricity and water, despite Chaitén’s precarious location at the base of a subsiding but still burbling caldera. Volcán Chaitén was the answer to the quiz I posed to award two copies of Moon Patagonia to aspiring travelers, and I finally have my winners. The first was Steve Behaegel of Merelbeke, Belgium, a Patagonia addict who has been there several times before and is planning, in the next austral summer, to go pack-rafting in the wilds of Lago O’Higgins, at the terminus of the Carretera Austral. The other goes to Oliver King of London, who intends to visit soon with his wife and young daughter. 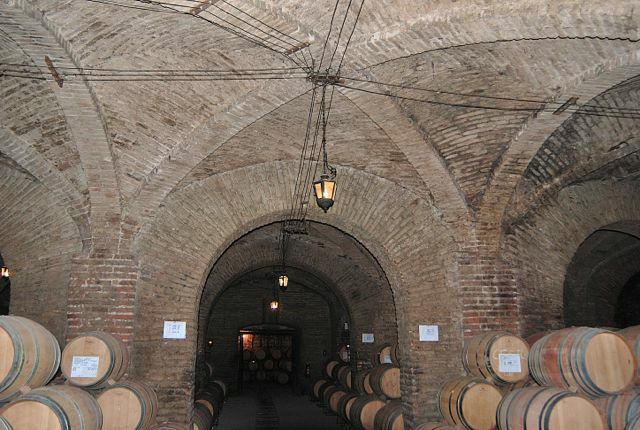 Oliver also identified Volcán Hudson as the Chilean volcano that erupted in 1991, burying large parts of southern Argentine Patagonia in ash, killing thousands of sheep and destroying the soft fruit and orchard production of Chile Chico and Los Antiguos (which has since recovered). In fact, Oliver told me, he was there at the time, and again in 2003. In the course of doing my first guidebook for a publisher whose name is best left unmentioned, I myself visited the area around Los Antiguos and Chile Chico just a few months before Hudson’s eruption. Even a couple years later, driving the Carretera Austral, I saw ash more than a meter deep on each side of the road, and the remnants of the eruption are still visible in the so-called Bosque Inundado (“sunken forest,” pictured above) along the Río Ibáñez. For those interested in this part of Patagonia, there’s good news that the Chilean energy giant Colbun has decided to refrain from pushing the massive HidroAysén dam project on the region’s endangered Baker and Pascua rivers (pictured above), at least for the time being. I’ll have something about this intriguing development in the near future.